That is something that we most likely can help you with. Give us a call and somebody will assist you, Toll Free: 800-577-5920. 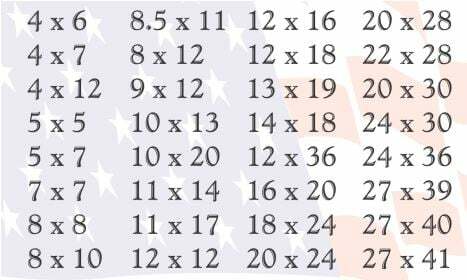 Is it possible to get 2- 12×24 poster frames? Is so, what would be the cost? Thanks in advance for your help. Do you sell 20 x 20 frames? I will not be using a boarder. My cardboard backing and picture fits frame size 20 x 20. I have a 30 year old poster that measures 22 x 32. Can I get a custom frame that size? Yes you certainly can! You can either visit the Design a Frame section of our website here: http://www.frameusa.com/design-a-frame Or you can find a frame you like on our site and scroll toward the bottom to the “Custom Sizes” tab and enter those dimensions.